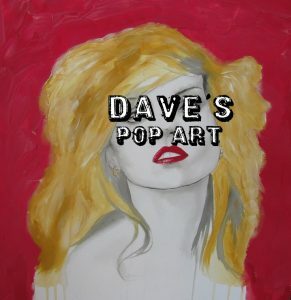 We're delighted to offer Gallery space at Alba Customs to Dave Gordon who will be exhibiting some of his 'Pop Art' from Friday 29th July until Friday 2nd September 2016. 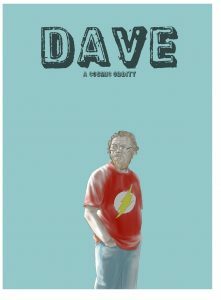 Dave Gordon always wanted to be an artist, growing up on a steady diet of sci-fi, both in movies and comics as well as a continual stream of comic books, it just seemed like a normal thing to want to do. So the normal stuff continued, preferring art classes to pretty much everything else at school and then moving on to a very brief stint in the Glasgow School of Art. Deciding that Glasgow just wasn’t for him he ditched it and went into the real world. The real world was sitting in a ‘studio’ in Edinburgh Council pretty much doing next to nothing. Comics once again stole his heart, spending much of his time in Edinburgh comic shops, he produced the first part of his iconic ‘Derna’ series.....after which he decided it was awful both in layout, plot and execution, it has to date, never seen the light of day. Midway through the 90’s he got two reasonable breaks, an offer of a graphic novel from Fantagraphics, and regular work in the European and American adult magazine industry doing editorial illustrations. During this time, the first cracks started to appear in his family life, he always knew he had been adopted, but now he felt more on the outside than ever. Seeking solace in a number of self-destructive relationships, he pressed on with his work and retreated from social life virtually completely. In late 97, he was first diagnosed with depression, this led to a number of pharmaceutical experiments, all of which numbed his creativity and deepening his depression. A further diagnosis of Agoraphobia, simply hobbled his output further. Finally, he decided that medication wasn’t working and forced himself to confront his problems head on, and for the most part it worked, it took time, but it helped him produce a piece of work that would be acclaimed but never finished ‘Little Eva’. ‘Little Eva’ embodied the desperation and frustration that he felt had held him back whilst fighting the depressive, and suffocating days of his self-imposed imprisonment. Anyone who has read it has always wanted more than the 30 pages that were actually finished. Dave has always stated a desire to go back to it, however he says that he has never been in the same place mentally, and any attempts to finalise it have never ‘felt’ quite right. In 2002, his then partner told him to get a ‘proper job’ as she couldn’t see herself marrying an artist. So as wedding preparations were made, Dave moved into a life in retail. Finding it a natural fit, he quickly went from part time grunt, to full time grunt and finally management grunt in the first six months. His art life was essentially, over, a ‘normal’ life had begun and there was no time to draw. On Valentines Day in 2003, it all came to a crashing halt, his partner, just three months prior to their wedding, told him she was leaving for her gym instructor, a man twice her age. At the same time the company employing Dave, went under. To make matters worse, his partner had been defrauding a financial establishment in Dave’s name, found guilty, Dave went to jail. After the 12 days in jail, Dave felt the crushing hand of depression again. Alcohol seemed to hold the answer, and for a few months it seemed to work. Finding commissions for a variety of things he kept his head above water, but only just. In late 2004, he got himself entangled with a woman in England, moving there to try to forge a new life away from the criticisms of his adopted mother and sister. Needless to say, despite once again climbing the management ladder in a significant retail environment, the personal life with a woman who had more baggage than Asda, began to flail and fall apart. Depression reared it’s ugly head once more after the death of his father, his current partner had also decided that Dave needed regular beatings, and because of his upbringing, he never fought back. Shunned by his adoptive family, he decided he needed a way out, he filled the car with fuel, bought a hose pipe and some duct tape and went to M&S car park in the dead of night. However, going through with the plan to end his life, would mean that ‘they’ had won. Angry he drove back to the house that he had with his partner. It wasn’t long before once again it all came to a head....literally. One day, the final day, he was verbally assaulted by the crazy woman, the confrontation ended with her swinging an iron at his head....narrowly missing delivering a killing blow. Dave decided, enough was enough, he grabbed what he could and left, heading north back to Edinburgh. Broke and broken, he was told there was no room for him at either his adopted mother’s house, or his adopted sister’s place. Dave wondered why the universe hated him. Help came in the form of Ronnie, they had shared a house when Dave first arrived in Edinburgh years before. Dave for the next eight months would occupy Ronnie’s spare room. Far from being an ideal situation, Dave found that once more, he was able to work...the urge and desire to draw had come back, and it seemed to be the only thing keeping him sane. One occasion saw Dave, in a fit of utter despair, begging Ronnie to help him end his life. Ronnie refused. Struggling to regain some normality, Dave set about a new project that would focus him for the months to come. 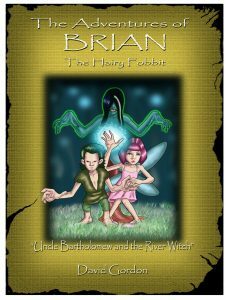 It ended in a book deal for what was to become his first and only children’s book ‘The Adventures of Brian the Hairy Fobbit’. However, bad luck prevailed, the publisher went under, and so too did the deal. In 2009, Dave met Lesley. The turning point. Dave will tell you that Lesley ‘saved’ him. The truth is, she helped him save himself. He re-found his focus and produced more than 9 books of work in less than 18 months. He self-published most of them under his own steam. In 2013 he started Chang31ings, a small business dedicated to not just publishing his own work, but also focussing on his vintage toy obsessions, finding the rare toys he once had as a child and finding like minded collectors to move them on to. In the last three years, Dave with Lesley’s regular input, has forged a small but fun place, where comics are made, toys are restored and custom built dolls are produced. The biggest part of this journey was, when Lesley suggested finding Dave’s birth mother. This came at the end of the biggest and probably hardest project Dave has ever embarked upon. In 2014 he found that doing his autobiography as a graphic novel, was helping him deal with many of his issues, in particular the anger he always knew was lurking in the shadows. 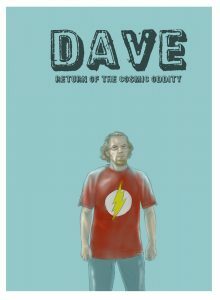 Using it as a vehicle to help him ‘evolve’ into a better person the ‘Cosmic Oddity’ book ends with Dave not only finding his birth mother, but attempting contact. Dave today, is very different to Dave of just a couple of years ago, both in looks temperament and outlook. He claims each day is still a struggle, but a struggle made easier by those around him. Currently working on learning how to paint again, he produces images that are very personal to him, they aren’t tailored for any particular market, his ‘pop art’ style of music and movie icons reflect the content of his ‘Groove Tube’ sketchbooks, his ‘Spacegirl’ digital art is linked closely to his involvement with the ongoing comic series ‘System Crash magazine’ in which he has a number of comic book properties. No surprise that the Cosmic Oddity series is about to continue with a third volume. If you ever ask Dave, what’s his favourite piece of his own work, more often than not he’ll say that he’s still to do something he’s completely happy with.